André Paul Guillaume Gide (French: [ɑ̃dʁe pɔl ɡijom ʒid]; 22 November 1869 – 19 February 1951) was a French author and winner of the Nobel Prize in Literature (in 1947). Gide's career ranged from its beginnings in the symbolist movement, to the advent of anticolonialism between the two World Wars. The author of more than fifty books, at the time of his death his obituary in The New York Times described him as "France's greatest contemporary man of letters" and "judged the greatest French writer of this century by the literary cognoscenti." 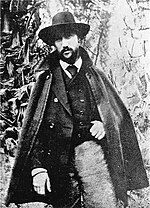 Known for his fiction as well as his autobiographical works, Gide exposes to public view the conflict and eventual reconciliation of the two sides of his personality (characterized by a Protestant austerity and a transgressive sexual adventurousness, respectively), which a strict and moralistic education had helped set at odds. Gide's work can be seen as an investigation of freedom and empowerment in the face of moralistic and puritanical constraints, and centers on his continuous effort to achieve intellectual honesty. His self-exploratory texts reflect his search of how to be fully oneself, including owning one's sexual nature, without at the same time betraying one's values. His political activity is shaped by the same ethos, as indicated by his repudiation of communism after his 1936 voyage to the USSR. Gide was born in Paris on 22 November 1869, into a middle-class Protestant family. His father was a Paris University professor of law who died in 1880. His uncle was the political economist Charles Gide. His paternal family traced its roots back to Italy, with his ancestors, the Guido's, moving to France and other western and northern European countries after converting to Protestantism during the 16th century, due to persecution. In 1908, Gide helped found the literary magazine Nouvelle Revue Française (The New French Review). In 1916, Marc Allégret, only 15 years old, became his lover. Marc was the son – one of five children – of Élie Allégret, who years before had been hired by Gide's mother to tutor her son in light of his weak grades in school, after which he and Gide became fast friends; Élie Allégret was best man at Gide's wedding. Gide and Marc fled to London, in retribution for which his wife burned all his correspondence – "the best part of myself," he later commented. In 1918, he met Dorothy Bussy, who was his friend for over thirty years and translated many of his works into English. In 1923, he sired a daughter, Catherine, by Elisabeth van Rysselberghe, a woman who was much younger than he. He had known her for a long time, as she was the daughter of his closest female friend, Maria Monnom, the wife of his friend the Belgian neo-impressionist painter Théo van Rysselberghe. This caused the only crisis in the long-standing relationship between Allégret and Gide and damaged the relation with van Rysselberghe. This was possibly Gide's only sexual liaison with a woman, and it was brief in the extreme. Catherine became his only descendant by blood. He liked to call Elisabeth "La Dame Blanche" ("The White Lady"). Elisabeth eventually left her husband to move to Paris and manage the practical aspects of Gide's life (they had adjoining apartments built for each on the rue Vavin). She worshiped him, but evidently they no longer had a sexual relationship. Gide's legal wife, Madeleine, died in 1938. Later he explored their unconsummated marriage in his memoir of Madeleine, Et nunc manet in te. From July 1926 to May 1927, he traveled through the French Equatorial Africa colony with his lover Marc Allégret. Gide went successively to Middle Congo (now the Republic of the Congo), Ubangi-Shari (now the Central African Republic), briefly to Chad and then to Cameroon before returning to France. He related his peregrinations in a journal called Travels in the Congo (French: Voyage au Congo) and Return from Chad (French: Retour du Tchad). In this published journal, he criticized the behavior of French business interests in the Congo and inspired reform. In particular, he strongly criticized the Large Concessions regime (French: Régime des Grandes Concessions), i.e., a regime according to which part of the colony was conceded to French companies and where these companies could exploit all of the area's natural resources, in particular rubber. He related, for instance, how natives were forced to leave their village for several weeks to collect rubber in the forest, and went as far as comparing their exploitation to slavery. The book had important influence on anti-colonialism movements in France and helped re-evaluate the impact of colonialism. During the 1930s, he briefly became a communist, or more precisely, a fellow traveler (he never formally joined any communist party). As a distinguished writer sympathizing with the cause of communism, he was invited to speak at Maxim Gorky's funeral and to tour the Soviet Union as a guest of the Soviet Union of Writers. He encountered censorship of his speeches and was particularly disillusioned with the state of culture under Soviet communism, breaking with his socialist friends[who?] in Retour de L'U.R.S.S. in 1936. Then would it not be better to, instead of playing on words, simply to acknowledge that the revolutionary spirit (or even simply the critical spirit) is no longer the correct thing, that it is not wanted any more? What is wanted now is compliance, conformism. What is desired and demanded is approval of all that is done in the U. S. S. R.; and an attempt is being made to obtain an approval that is not mere resignation, but a sincere, an enthusiastic approval. What is most astounding is that this attempt is successful. On the other hand the smallest protest, the least criticism, is liable to the severest penalties, and in fact is immediately stifled. And I doubt whether in any other country in the world, even Hitler's Germany, thought to be less free, more bowed down, more fearful (terrorized), more vassalized. —  André Gide Return from the U. S. S. R.
He left France for Africa in 1942 and lived in Tunis until the end of World War II. In 1947, he received the Nobel Prize in Literature "for his comprehensive and artistically significant writings, in which human problems and conditions have been presented with a fearless love of truth and keen psychological insight". He devoted much of his last years to publishing his Journal. Gide died in Paris on 19 February 1951. The Roman Catholic Church placed his works on the Index of Forbidden Books in 1952. Gide was, by general consent, one of the dozen most important writers of the 20th century. Moreover, no writer of such stature had led such an interesting life, a life accessibly interesting to us as readers of his autobiographical writings, his journal, his voluminous correspondence and the testimony of others. It was the life of a man engaging not only in the business of artistic creation, but reflecting on that process in his journal, reading that work to his friends and discussing it with them; a man who knew and corresponded with all the major literary figures of his own country and with many in Germany and England; who found daily nourishment in the Latin, French, English and German classics, and, for much of his life, in the Bible; [who enjoyed playing Chopin and other classic works on the piano;] and who engaged in commenting on the moral, political and sexual questions of the day. "Gide's fame rested ultimately, of course, on his literary works. But, unlike many writers, he was no recluse: he had a need of friendship and a genius for sustaining it." But his "capacity for love was not confined to his friends: it spilled over into a concern for others less fortunate than himself." 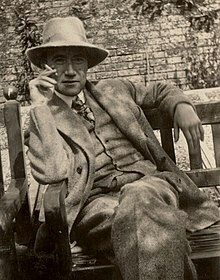 André Gide's writings spanned many genres – "As a master of prose narrative, occasional dramatist and translator, literary critic, letter writer, essayist, and diarist, André Gide provided twentieth-century French literature with one of its most intriguing examples of the man of letters." But as Gide's biographer Alan Sheridan points out, "It is the fiction that lies at the summit of Gide's work." "Here, as in the oeuvre as a whole, what strikes one first is the variety. Here, too, we see Gide's curiosity, his youthfulness, at work: a refusal to mine only one seam, to repeat successful formulas...The fiction spans the early years of Symbolism, to the "comic, more inventive, even fantastic" pieces, to the later "serious, heavily autobiographical, first-person narratives"...In France Gide was considered a great stylist in the classical sense, "with his clear, succinct, spare, deliberately, subtly phrased sentences." Gide's surviving letters run into the thousands. But it is the Journal that Sheridan calls "the pre-eminently Gidean mode of expression." "His first novel emerged from Gide's own journal, and many of the first-person narratives read more or less like journals. In Les faux-monnayeurs, Edouard's journal provides an alternative voice to the narrator's." "In 1946, when Pierre Herbert asked Gide which of his books he would choose if only one were to survive," Gide replied, 'I think it would be my Journal.'" Beginning at the age of eighteen or nineteen, Gide kept a journal all of his life and when these were first made available to the public, they ran to thirteen hundred pages. "Each volume that Gide wrote was intended to challenge itself, what had preceded it, and what could conceivably follow it. This characteristic, according to Daniel Moutote in his Cahiers de André Gide essay, is what makes Gide's work 'essentially modern': the 'perpetual renewal of the values by which one lives.'" Gide wrote in his Journal in 1930: "The only drama that really interests me and that I should always be willing to depict anew, is the debate of the individual with whatever keeps him from being authentic, with whatever is opposed to his integrity, to his integration. Most often the obstacle is within him. And all the rest is merely accidental." As a whole, "The works of André Gide reveal his passionate revolt against the restraints and conventions inherited from 19th-century France. He sought to uncover the authentic self beneath its contradictory masks." In his journal, Gide distinguishes between adult-attracted "sodomites" and boy-loving "pederasts", categorizing himself as the latter. Gide's novel Corydon, which he considered his most important work, erects a defense of pederasty. ^ "new york time obituary". www.andregide.org. Archived from the original on 6 August 2011. Retrieved 20 March 2018. 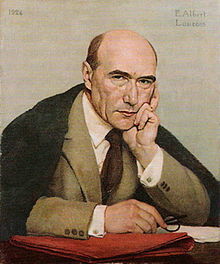 ^ "André Gide (1869-1951) - Musée virtuel du Protestantisme". www.museeprotestant.org. Retrieved 20 March 2018. ^ White, Edmund (10 December 1998). "On the chance that a shepherd boy …". pp. 3–6. Retrieved 20 March 2018 – via London Review of Books. ^ "André Gide - Biographical". www.nobelprize.org. Retrieved 20 March 2018. ^ "The Nobel Prize in Literature 1947". www.nobelprize.org. Retrieved 20 March 2018. '^ Article on André Gide in Contemporary Authors Online 2003. Retrieved with library card October 2014. ^ Information in this paragraph is extracted from André Gide: A Life in the Present by Alan Sheridan, pp. 629-33. ^ Information in this paragraph is extracted from André Gide: A Life in the Present by Alan Sheridan, pages 628. ^ Journals: 1889-1913 by André Gide, trans. by Justin O'Brien, p. xii. ^ Journals: 1889-1913 by André Gide, trans. by Justin O'Brien, p. xvii. ^ Quote taken from the article on André Gide in the Encyclopedia of World Biography, Dec. 12, 1998, Gale Pub. Retrieved with library card October 2014. ^ Gide, Andre (1948). The Journals Of André Gide, Vol II 1914-1927. Alfred A. Knopf. pp. 246–247. ISBN 978-0252069307. Retrieved 27 April 2016. ^ Gide, Andre (1935). If It Die: An Autobiography (New ed.). Random House. p. 288. ISBN 978-0375726064. Retrieved 27 April 2016.